The Orphan Drug Act has been helping sarcoidosis patients receive better treatment options for the last 35 years. Help us ensure its future! 2018 marks the 35-year anniversary of the passing of the Orphan Drug Act. This act provides rare disease patients, like sarcoidosis warriors, with better access to treatment by encouraging companies to invest in rare disease drug development. The passing of this bill has helped over 730 orphan drugs be approved, providing treatment to over 11 million rare disease patients. In the early 1980’s it’s estimated that approximately 20-25 million patients suffered from approximately 5,000 rare diseases. Drug companies were unwilling to invest in drug development for these diseases because they were costly, hard to prove effective, and offered very little pay out. This means that prior to 1983, only 34 drugs had been approved (using today’s orphan drug definition) to help those with rare diseases. Rare disease patients were upset by the lack of drug development and began to advocate for better treatment options. Grassroots efforts were lead by patients and advocacy groups from rare diseases like Gaucher’s Disease, Tourette’s Syndrom, Huntington’s Disease, Severe Combined Immunodeficiency (SCID) and many other diseases. These advocacy groups eventually combined into a coalition which developed into the National Organization for Rare Disorders (NORD). In 1983, the Orphan Drug act passed with help from NORD advocates, Senator Orrin Hatch, and Representative Henry A Waxman. What Does the Orphan Drug Act Do? Rare disease definition Less than 200,000 patients in the U.S. or more than 200,000 patients, but with no expectation that the cost of creating this drug will be made back through sales The goal of the ODA is to convince more drug manufacturers to provide treatments for rare diseases. Market exclusivity Seven years where no one else can sell a generic version of the drug Typically companies receive five years of market exclusivity. The ODA provides an extra two years before generic drugs can be made, incentivizing drug companies to invest in these drugs. Tax incentives Companies that develop orphan drugs can collect tax credits to help cover the cost of creating the drugs This lowers the cost of drug development for companies. Clinical research subsidies Provides funding to test new therapies to treat and/or diagnose rare diseases This also lowers the cost of drug development for companies. The FDA has helped fund 590 studies so far and helped 60 products gain approval. As of today, there are approximately 7,000 rare diseases affecting 25-30 million people in the U.S. Children make up more than half of those affected. 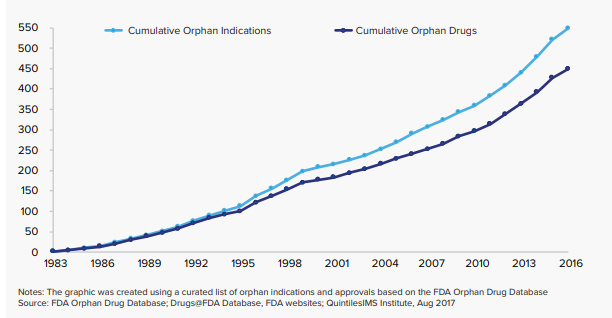 There has been a major increase in the number of treatments available to rare disease patients with 594 orphan drugs approved in 2016, but there is still a long way to go. Of the 7,000 rare diseases in the U.S only 5% have treatments available today. For sarcoidosis patients, there are only two FDA approved sarcoidosis drugs neither the result of the ODA. This is why the ODA is critical to sarcoidosis patients. There are several promising drugs in the pipeline and the ODA will help those treatments reach patients faster. In order continue the growth in rare disease treatments that we have seen over the last 35 years, we need to ensure the Orphan Drug Act continues to receive government support. Last year, Congress decided to no longer give tax credits to companies to cover the expenses of drug development. This is a major blow to one of the key parts of this act. Recently, though, Senator Hatch and Representatives Lance and Butterfield introduced a Resolution about the ODA. This resolution would reestablish Congress’s commitment to the ODA and help ensure the future success of the act. The Orphan Drug Act and this resolution are essential to ensuring the future availability of sarcoidosis treatments. If you are in support of the ODA, show it by doing one of the following!